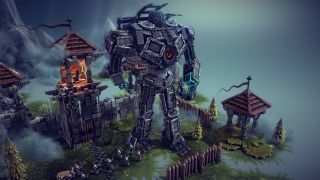 As the Steam store has it, "Besiege is a physics based building game in which you construct medieval siege engines and lay waste to immense fortresses and peaceful hamlets." As modder Drako sees it, Besiege is a proving ground for futuristic death machines straight out of Pacific Rim. Somehow Drako has created a walking, bipedal, rocket-firing Gipsy Danger with functioning fingers. Its only downside? This Jaeger can't turn. But rotation is a mere detail when you can have a fleet of Shadé's V-50 Jumphawk helicopters pick it up and sweep it away to the next battlefield. We'd constructed a list of the most impressive Besiege engines, but Gipsy Danger might just top it. Rain anachronistic devastation upon peasants yourself by getting it straight from the Steam Workshop.